Stapleford near Cambridge was first mentioned in 956 when it was given the Latinised name of Stapelforda. Unlike most parishes, thespelling has hardly changed since then. The parish, however, was inhabited long before this. Wandlebury Ring, which lies within the parish boundary, is an Iron Age hill fort, originally built in the 3rd century B.C., but rebuilt with a double bank in the first century A.D. The village probably began near the ford across the Granta in the south-west corner of the parish, by a post (a staple) which marked the ford and gave the village its name. On the north-west side of the parish there were some sixty acres of open-field land, called the Ming Lands which were shared with Great Shelford. The Inclosure award of 1814 drew a boundary between the two parishes. Until the Inclosure in 1814, there survived a Green of about 30 acres, which extended from Bar Lane across the sites of Cherry Tree Avenue and Greenfield Close to the far side of Haverhill Road, up Bar Lane nearly to Green Hedge Farm and across Bar Lane to include the site of the School. This Green, including the pond on the corner of Bury Road and Haverhill Road was then allotted to separate owners and at the same time Bar Lane was laid out in its present course, rather than around the edge of the Green, a line which it had followed until then. The population in 1801 was 235 and in 1831 464. In 1871 it reached a peak of 594, not exceeded until 1931 when it attained 636. Since then numbers have steadily climbed to 831 in 1951, 1548 in 1961, 1668 in 1981 and 1749 in 1991, and slightly decreased to 1738 in 2001. The boundaries of the parish remained almost unchanged until 1985, when Bridge End Cottage and Dingle Dell were gained from Sawston and a small uninhabited area in the river bend was moved from Stapleford to Sawston. The ancient parish contained 1835 acres (743 hectares). The opening of Shelford railway station in 1845 had a great effect on the development of Great Shelford and to a lesser extent on Stapleford. Several large houses were built in Mingle Lane and elsewhere in the village. Four substantial mansions were built on Foxhill soon after 1900. These included Middlefield designed by Sir Edwin Lutyens. Development of the village has continued slowly. The row of 32 houses in Haverhill Road was built by the late Frederick Baynes on land acquired from the Foster estate in the later 1930s. Some council houses were built in Bury Road in 1926 and others were built at the end of Gog Magog Way in the 1950s. The Priam’s Way estate and Greenfield Close were built in the 1950s, Finch’s Close in the late 1950s, Aylesford Way (in several stages) in the 1950s – 1970s, Poplar Way and Forge End in the 1960s, the Vine Farm estate and Cherry Tree Avenue in the 1970s, Joscelynes (in two stages) in the 1970s and 1980s, Cox’s Close and Heffer Close in the 1980s, Anvil Close in the 1980s and 1990s, Adcroft Piece in the 1990s and Greenhedges in 2007. The new South Cambridgeshire Local Plan has designated an area between London Road and Aylesford Way for future development, while retaining the land presently used for industry in Granta Terrace as “employment land”. Stapleford street names have suffered many changes. Mingle Lane was called Church Road in 1814, later becoming Church Lane. Gog Magog Way was called Back Road in 1814, later becoming partly Church Lane and partly Lordship Lane. It was also known as West Lane. Bury Road was called Hills Road in 1816, later becoming partly Bar Lane, partly Poplar Terrace and partly Bury End. Bar Lane was called Bar Lane Road in 1816. London Road was formerly known as The Street or The Village Street, but has been London Road since at least 1850. Church Street has been so called since at least 1740. Babraham Road was called Linton Road until 1958. Hinton Way was formerly known as Cherry Hinton Road. Some street names, particularly those of terraces, have vanished though some may still be seen marked on house frontages. St. Mary’s Cottages, Vine Terrace, Brookside and Alma Cottages were all in Bar Lane. Petersfield Terrace, Bury End and Poplar Terrace were in Bury Road. Feoffee Cottages were in Church Street and Lordship Terrace was in Gog Magog Way. One modern street name has unfortunately been given in error. Adcroft Piece was named after the house called Ancroft Piece at 76 London Road but the name was altered to Adcroft, as it had been spelled in the Inclosure award. In this case, however, the Inclosure award was wrong and every other source gives the old field name as Ancroft. Something similar affected Greenhedge Farm, so called because it lay on the edge of the one-time Green. The former Special School corrupted the name to Green Hedges and this has now been perpetuated in the small housing estate built on its site. The road that runs through the village from Great Shelford to Sawston and Great Chesterford (A1301) was a turnpike road from 1724 to 1870. The road from Cambridge to Linton and Haverhill (A1307) was likewise a turnpike road from 1765 to 1876. Stapleford was formerly crossed by the railway to Haverhill, which branched from the Liverpool Street line south of the London Road bridge. The line was opened in 1865 but closed in 1967 and is now dismantled, though the humped bridge where it passed under the road to Sawston still remains. Opening of the M11 motorway in 1980 relieved Stapleford and neighbouring parishes of much of the traffic which had formerly used the A1301. Continuing increase of local traffic, however, necessitated the construction in August 1997 of a pelican crossing across London Road at the Post Office, which has since become a photographic studio. The Parish Council had first requested a crossing there in 1964. In September 1989, the District Council defined an area in Mingle Lane and Gog Magog Way, together with two properties in Dukes Meadow and four in Church Street, as a conservation area. The history of Stapleford is fully described in the Victoria County History of Cambridgeshire. Volume 8, 1982 pp. 227-238 More recent history, assembled from reports in the Cambridge Chronicle, appears in the Stapleford Chronicle, 1770-1899, by Mary Miller, 1982. The history of the village as described in the minutes of the Parish council is summarised in Stapleford Matters, 1894-1994, by Tony Doggett, 1994. Stapleford Millennium Chronicle, Volume 1, edited by Alan Bullwinkle, 2000, contains news about some of the inhabitants and happenings in the village from 1900 to 1939. Copies of this are still available locally. The Stapleford Chronicle, Volume 2, edited by Dorothy Millgate and covering the years 1939-1977, was published in 2007. Grade II listed building (early 15th century), removed from original site in Tadlow and re-erected here in 1980. Grade II listed building (early 19th century) – circular plan and conical roof, with 20th century additions. Another ancient monument, lying at Little Trees Hill, on the other side of the A1307 from Wandlebury. Dormer Cottage, No. 5 Bar Lane. Grade II listed cottage built around 1750 with timber frame and tiled mansard roof. Grade II listed cottage built around 1800. Grade II listed building dated circa. 1630 – timber framed and thatched roof, extended c. 1700. No. 2 and 4 Church Street. The two cottages, illustrated below, are grade II listed buildings, with timber frame and thatched roof, dating from about 1700. They were transferred to South Cambridgeshire District Council who, together with the Cambridgeshire Cottage Improvement Society, restored them to their present condition. The administration and ownership of the cottages now rests with the Cottage Housing Society. Grade II listed building, built about 1840. It is described under Parish Council property below. Grade II listed building converted from a dovecot. Originally about 16th century, but the door and window openings are 20th century. Starred grade II listed building. Designed in 1908 by Sir Edwin Lutyens for Henry Bond of Trinity Hall, a Lecturer in Law. The house was later called Mount Blow, but has now reverted to its original name. Associated with Middlefield, though not listed buildings, are Middlefield Lodge, now called The House on the Hill, Middlefield Cottage and Keeper’s Cottage, all of them probably designed in Lutyens’ workshop. Grade II listed building, originally a single house by William Flockhart. Starred grade II listed buildings, described under Churches. Grade II listed building, 15th century, with mid-17th century alterations. The Particular Baptist Chapel was in Church Street. There was a congregation of Particular Baptists in Stapleford from about 1855, though they had met for worship in barns in the parish from as early as 1808. A site for a new chapel, named the Providence Baptist Chapel, was provided by Richard Headley in 1863. The chapel was slightly extended in 1947, but, following disagreement over church rules, was sold by the Midland Strict Baptist Association in 1975. It is now a private residence, 9A Church Street. Magog Down is an impressive sweep of Cambridgeshire hillside, restored from the farmland to walks, woodlands and meadows, for conservation and informal recreation. The area of 163 acres, neighbouring the Wandlebury country park, was purchased in1989 by the Magog Trust, a registered charity, which was set up specifically for the task. This wildlife haven nurtures 24,000 trees and many species of wild flowers, grasses and abundant wildlife. The perimeter walk stretches for 2.25 miles and has been developed especially for dog walkers, allowing a leash-free walk around the site. In 1996 the Magog Trust achieved a highly commended in the Henry Ford European Conservation Awards for Natural Environment projects. It is freely open to all; there are environmental rules that ensure that everyone can enjoy the peace and beauty. A Blacksmith’s Shop formerly stood at the junction of Church Street and London Road. It was later converted into three cottages, being known as The Triangle. The cottages became derelict and were purchased by the County Council from Beatrice Minnie Harris in 1913 to improve the road junction. 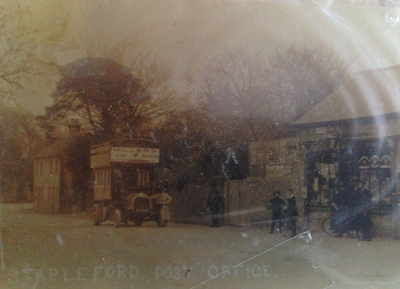 A Public Pump in a tall wooden casing formerly stood in the road at the junction of Bar Lane and Bury Road. Before mains water came to the village in 1936 some residents depended on it for their supply, though many properties had their own wells. In 1948 it was reported to be out of order and the Parish Council asked for it to be dismantled. It had for long been a landmark, and continued to give a name to the local bus stop. The Rose Public House in London Road dates in part from 1665, and the remainder from 1707 or earlier. It was probably licensed from at least 1728, and was called The Rainbow in 1740, but by 1764 had been renamed The Rose and Crown. It retained this name in legal records until 1897. The Longbow Public House in Church Street was formerly the Three Horse Shows. The earliest licensee that can be traced was Daniel Rider in 1815. After closure and refurbishment it was reopened as The Longbow in 1976. The Tree Public House in Bar Lane is recorded from 1895. It was rebuilt in 1979. Other vanished public houses and beer houses were the Dolphin (1861-1920), commemorated in Dolphin Way, the Hammer and Anvil (1875-99), the Millwrights Arms, possibly the same as The Tree (1871), the Gipsy Weaver (1871) and The Bell (1774-82) which was no doubt the same as The Light Horse (1783-84).